Tells Casey Abrams "You are so f---ing great"
A fan favorite was voted off in a surprising elimination. 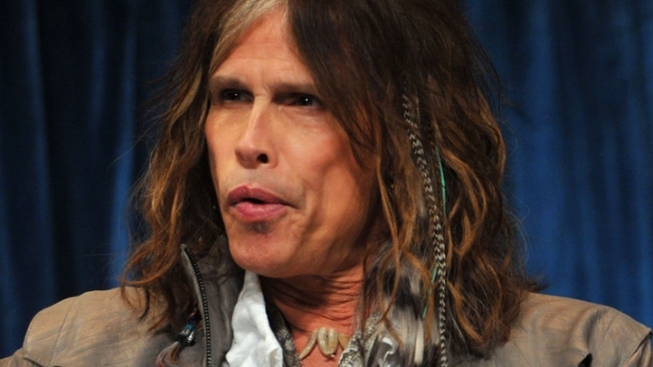 Steven Tyler just can't edit himself. The Aerosmith singer and "American Idol" judge dropped an f-bomb on the hit show, telling Casey Abrams he makes people jealous because "You're so f---ing great." The audiece was aghast, according to The Hollywood Reporter, but producer Nigel Lythgoe laughed it off, making his way to the stage and jokingly putting tape over Tyler's mouth. Meanwhile, the comment from Tyler wasn't the only sign Abrams stole the show. After singing Maroon 5’s “Harder to Breathe,” he planted a kiss on Jennifer Lopez's cheek, and the diva later complimented his "soft lips." "I kissed Jennifer Lopez and made Steven Tyler swear," Abrams boasted later. Selected Reading: The Hollywood Reporter, Entertainment Weekly, E! Online.